October 9, 2010 by Fr. C.
This morning, a somewhat creaky dean took his bike to St. Alban’s for the first time-a trip of 10 minutes from the rectory. The prospect had not been inviting until Richmond’s long summer of incredibly hot weather finally broke. It is amazing what one can see in, and learn abou,t a neighborhood just by getting out of the car and walking or cycling. I learned on the way home from Morning Prayer, for example, that there is good coffee to be had five blocks away in a little cafe with outside tables. More to the point, it is a joy to have real, human interaction in a community. While ours is a “diverse” community, southern civility generally prevails and the dog walkers mingle with the Saturday poetry club, the early rising professor, Tea Party goers, and the numerous pierced and tatooed artistes and their fellow travelers. 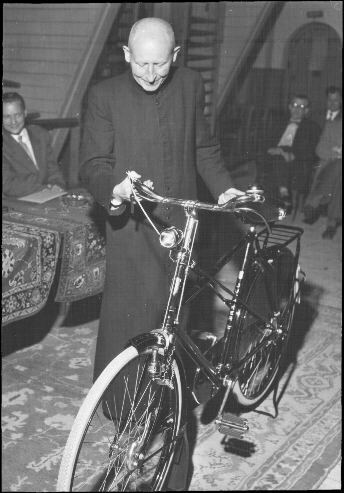 Cycling clergy appear to be a novelty, for now. And so, the thought I would pose following my Tour de Ginter Park is how do all of us personalize the world for Christ and how can we improve our own individual witness? Now, it’s off to the Motrin and knee wrap!